The OPTISYS IND 8100 is a hygienic inductive conductivity measuring system designed for the food and cosmetics industry. With its extremely fast response time the compact stainless steel device is particularly suitable for applications in the field of product separation or CIP systems to shorten transition phases. 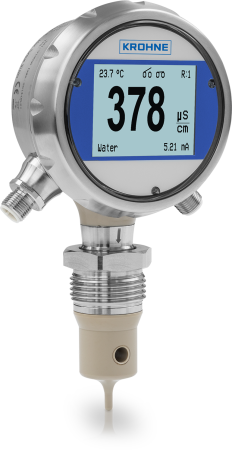 The 3A and EHEDG certified system (special adapters required) has a fast-responding integrated temperature sensor allowing for reliable and cost-saving product identification, e.g. of the various CIP agents. Process status information is provided by three different display background colours and controlled by alarm settings. 14 different measuring ranges and four factory-set concentration ranges (e.g. for caustic soda, nitric acid etc.) plus customer-programmable media allow for an individual adaptation to process needs. Two switch outputs are available for alarm or control purposes and two relay inputs enable remote control of range settings. The system comes with various hygienic process adapters like Tri-Clamp, conical nozzle (DIN 11851), SMS or VARIVENT®.